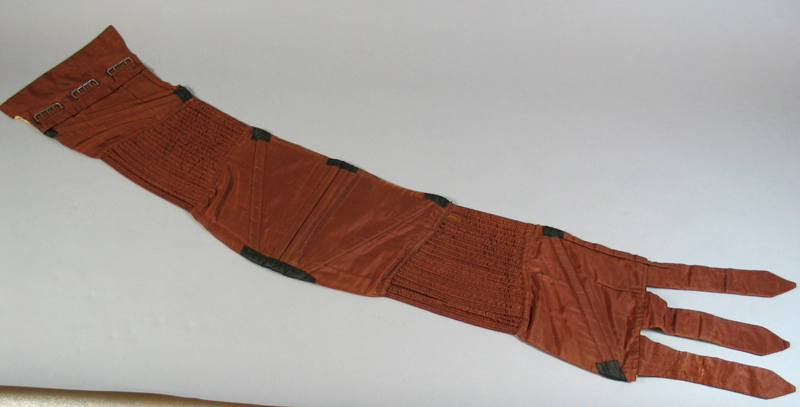 In 1994, the Museum acquired a selection of garments that once belonged to Purser Thomas John Chew. Mr Chew sailed on Constitution at the beginning of the War of 1812, and was on board when the ship captured HMS Guerriere. Swapping jobs with the Boston Navy Yard’s Purser for a time, he next joined his good friend James Lawrence on the frigate Chesapeake. According to family tradition, Chew sat beside his wounded captain when he uttered his famous “Don’t give up the ship” command. Paroled by the British and returned to Boston, Chew next ventured north to join the American squadron on Lake Ontario. After the war, he sailed on the new ship-of-the-line Washington to the Mediterranean. He retired in 1832 and spent the rest of his days in Brooklyn, New York. Tumbled in his seabag (helpfully emblazoned “T.J. Chew, U.S. Navy) were two pairs of trousers, a shirt, some silk suspenders, a pair of moccasins, and a odd contraption consisting of whalebone battens and narrow steel springs tightly encased in polished cotton. It turns out that this wonderful survivor is a man’s corset or stays. 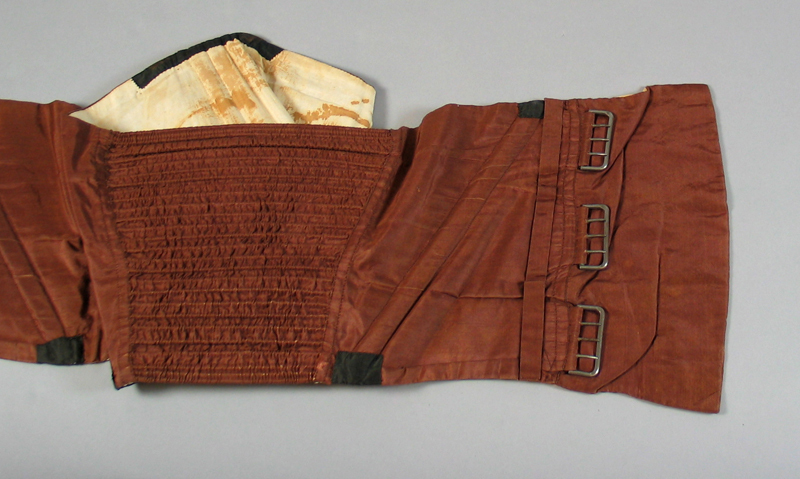 Thomas Chew’s corset. The whalebone battens hold in the stomach, while the metal springs confine the rest of what later generations would call the “spare tire.” USS Constitution Museum collection. A man’s corset. That’s a bit strange, eh? Worn over the shirt, but under the trousers, vest, and coat, the corset performed the same task as it did for a woman – it rearranged the soft bits into a more pleasing and fashionable shape. But rather than enhancing the bust, the man’s corset only reduced the waist. We’ve all made questionable fashion choices to fit in (or not, as the case may be). Anyone remember the 1980s? At any rate, Purser Chew was simply participating in a phenomenon sweeping the western European (and American) fashion world. According to The Workwoman’s Guide of 1838, stays or corsets were used in the army (especially among the cavalry), for hunting, and for strenuous exercise, not unlike a weight lifter’s belt today. Go to any warehouse where people lift heavy things, and you’ll see a similar garment in use. But, there was more than function to this form, and the corset had other uses beyond supporting a weak back. 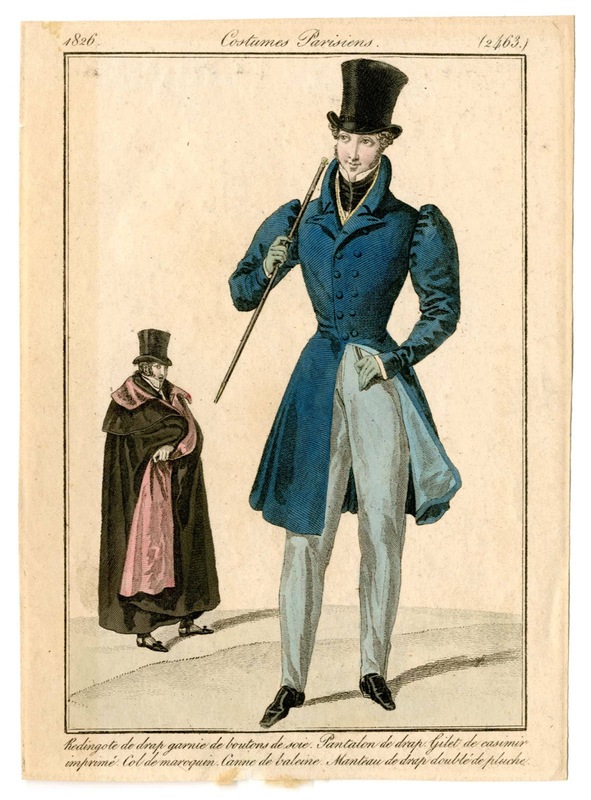 Since the end of the eighteenth century, the fashionable man’s profile had been in flux. The man’s corset assisted the man of fashion to achieve the narrow-waisted look so popular in the late 1820s and 1830s. Plate from Costumes Parisiens showing the fashions of 1826. 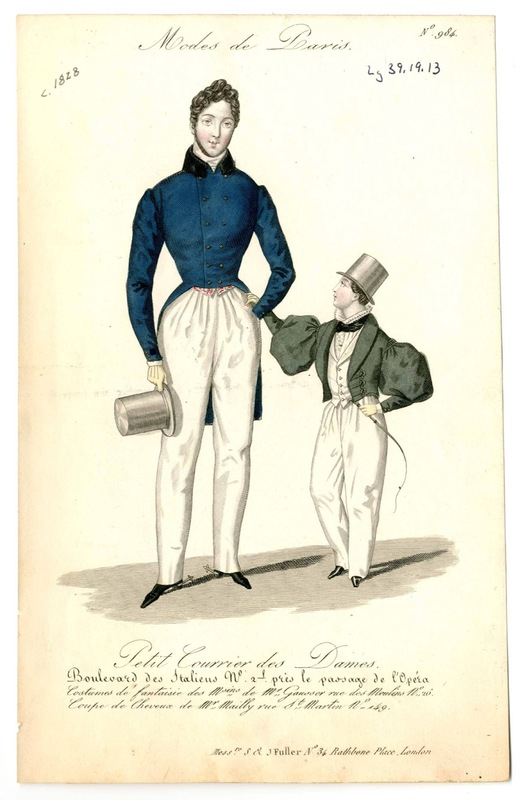 Plate from Modes de Paris showing the fashions of 1828. Notice the extremely narrow waist, padded chest, wide shoulders and hips, and puffed sleeve cap. Despite the compelling reasons for wearing the corset, the practice was not without controversy. Many considered the very idea ridiculous, but others looked with uneasiness on a practice that they feared contributed to the effeminacy of men and a concomitant loss of national strength and military might. When I was preparing for sea, a well-informed friend of mine, advised me to get check-shirts, which she had understood, were usually worn by officers, out of port. It was a great mistake: officers are always neatly and genteelly dressed; and, on Sunday, we have, comparatively, as great a parade of “Jimmy fellows,” if I may use a phrase I often hear, as you will meet, even in Broadway. A Jimmy fellow, means one, dressed at the height of fashion; starched, and all in order; for whom, by the way, our ship forms an excellent band-box; an advantage, which your Jimmies ashore never have. While some may have scoffed at the expense and trouble incurred by officers in the the pursuit of fine dressing, such displays had an important function in the shipboard community. Clothing reinforced the separation between the enlisted men and officers in a way that even the most inattentive viewer could never mistake.